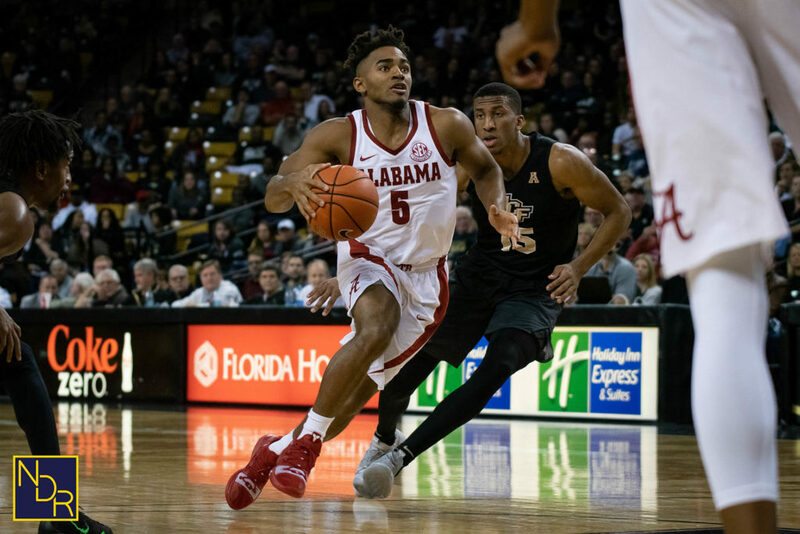 Alabama will attempt to bounce back from its second loss of the season on Tuesday when it welcomes a tough Georgia State (KenPom: 114) team into Coleman Coliseum. The Panthers (5-3) have already beaten one SEC school (Georgia) by 24 points so Alabama will need to be locked in for this one. Game time is 7 P.M. CT. The game will be streamed via SEC Network+. My Two Cents: There are no nights off for this team from a scheduling standpoint. Georgia State is yet another opponent that is expected to contend for their league title. As I mentioned, the Panthers have already dispatched Georgia by 24 points, and the program has reached the tournament twice in the last four years. In addition, Georgia State has finished first or second in the Sun Belt in four of coach Ron Hunter's five seasons. They're a good team, and quite capable of leaving Tuscaloosa with a win on Tuesday night. It's worth noting that the Panthers play small, with no one on their starting lineup taller than 6'6. That's one more reason for Avery to scrap the lineup with two bigs and roll with a smaller lineup to start the game; be it Alex at the four, or even a guard-heavy lineup with Dazon or T-Mack. I dont doubt that Avery had good intentions when making the decision to go with the two-bigs lineup to start the season, but it hasn't worked particularly well. I'm a big fan of Galin and the improvement he's made from the beginning of last season to now, but he doesn't really give the team a dynamic scoring or defensive presence at this point. The team is better with him coming off the bench and going with a smaller, quicker lineup that features more scoring options. Avery started the second half at UCF with Alex in place of Galin. In postgame comments Avery made to Chris Stewart about slow starts, he led me to believe that we will see a different starting lineup on Tuesday. Players to Watch: Alex Reese has been a very steady player for Alabama off the bench this season. Is it possible he starts on Tuesday night? While Alex isn't going to win any postseason defensive awards, he is arguably the best shooter on this team, a capable rebounder, and plays with confidence. For an Alabama team looking for a better start to the game, Alex could be the answer. Update: Avery mentioned in his press conference on Monday that Alex sprained his ankle during practice and is "day-to-day" so there's a possibility he won't play in this game. Georgia State will likely have the best player on the floor Tuesday night. D'Marcus Simonds is a potential All-American in his junior season. He enters this game averaging 21.6 ppg, 4.6 rpg and 3.5 apg. In Georgia State's eight games, Simonds has scored 20 or more six times. Also, keep an eye on former Alabama player Devin Mitchell. Devin was the second-leading scorer for the Panthers last season (12 ppg, 44.7% from 3), but missed the first seven games of this season due to injury. He returned in their last game, a loss to Liberty (another Alabama opponent), and played 11 minutes without scoring. He appears to be working his way back into game shape, but I suspect he's looking forward to this game. Prediction: Expect another tough game on Tuesday night. The Panthers are a talented, experienced, well-coached team. Meanwhile, Alabama is a deep, talented team in their own right, but one that appears to still be trying to figure things out. The hope is that we see a lineup change to start the game, and that leads to a quick start.